It has now been over seven months since the last coordinated industrial action over public sector pensions. In the interim, the issue has died and for most of the union members involved in the dispute the consensus is that we lost. Steven has already analysed this in depth from the perspective of a Unison member and I don't want to retread the same ground. However, I will note that the final nail in the coffin of this fight was hammered in during PCS's annual conference not long after the May 10 strikes. Despite rhetoric about "throwing down the gauntlet" and continued talk of more strikes in June, those of us not towing the leadership line pretty much guessed that the fight was over. This was an admission that we had lost, without the humiliation of ever having to actually say the words. So what's changed since then? Not the position of other unions, which was always just a shield for the "fighting left leadership" of the union movement to do sod all - as evidenced by us not joining the doctors' strike or pushing to strike with the NUT and NASUWT on the back of the teachers' work-to-rule. Rather, emboldened by the inaction of the unions, the government pushed further - and rank-and-file civil servants kicked back. I've documented the emergence of the Civil Service Rank & File (CSRF) Network here. The CSRF has so far held a national day of action on 14 November and moved the PCS National Executive Committee into calling a follow-up day of action on 30 November. Beyond these two days, workers in some offices have held further protests and walkouts - even an in-work stoppage in one case, where all staff took an hour out to read the Civil Service Reform Plan in full. This month, the NEC followed up by formally announcing its intent to ballot members over a range of issues in the new year. The union's national executive has agreed plans for a determined campaign for fair pay and working conditions, including a ballot for industrial action by more than a quarter of a million civil and public servants. As well as lifting the pay freeze and 1% cap, the union's claim includes pay rises of £1,200 or 5% and the introduction of the living wage on government contracts, defending terms and conditions, and opposing privatisation and cuts to pensions and jobs. The decision comes just days after the successful protests on Friday 30 November where members held lunchtime demonstrations in opposition to the government's latest attack on working conditions – including hours, holidays, flexible working and family-friendly policies – as well as cuts to jobs, pay and pensions. The NEC agreed that if employers do not respond satisfactorily to our demands, we will move to a national ballot in the new year for a programme of industrial action. It would seem, then, that the union was moving in the right direction. The latest briefing to branches even (finally) concedes that though they are still "working to build co-ordinated joint union industrial action," as this "is unlikely in the short term" they "now need to consider action [...] in pursuit of specific PCS demands." However, whilst small-scale rank-and-file action has caused some movement, there are still a number of problems with where the union is at compared to where it needs to be. A national dispute or sectional talks? As mentioned in my post on the emergence of the CSRF, the original position of the union was to start from sectional talks. An NEC Policy Brief which came out on 12 October (two days after the Guardian reported the leaked government plans) accepts talks at Department and Agency level and that separate "bargaining areas" should each draw up their own campaign plans. The objection to this from members was obvious. Though on paper the NEC dictated that "no detrimental changes are agreed," the potential for picking off members in separate disputes was obvious. This was a civil service wide issue and should be subject to a national dispute. With the 30 November action and the promise of a ballot in the new year, that appeared to be the position. However, on the same day that members protested nationally, individual groups received proposals from the departments where their members worked. We know this only because those presented to the Revenue & Customs Group Executive Committee were leaked. A mobility clause allowing staff to be moved to any office and any department, anywhere in the country. The effect of most of these changes is fairly obvious, though some of the issues are discussed in more depth in this libcom post containing the complete leaked Cabinet Office documents and this briefing issued by my own branch. Equally worrying for members, though, was how this was being dealt with. The GEC took the decision to keep the proposals in confidence, which is why the rest of us only saw the proposals because of a leak. This was bad enough from the point of view that, if you're trying to motivate members over an attack on their terms and conditions, it makes little sense to hide the full implications of that attack. But more than that, if the bosses are attacking us, why should workers have any pretence that those who keep the bosses' confidence are on their side? In part, this can be boiled down to left-right dynamics unique to that GEC1. However, it remains the case that the original leadership position of indulging sectional talks also specified that "all proposals are sent to the National Bargaining, Pay and Pensions department (NBPP) before any proposals are put to members." In other words, despite the internal dynamics of Revenue & Customs Group, the NEC was also asking that the flow of information to members be strictly controlled. The first set of proposals were formally withdrawn, supposedly following PCS representations though we cannot discount the impact of the leak and the furore it created. But another set is no doubt on its way. In other groups, we have no idea what proposals have been put on the table and where talks are at. If I can think of more than a few ways to use this situation to scupper the prospects of national action so as to pick civil servants off department-by-department, I'm sure the government can too2. Clearly, then, a key worry for civil servants is the persistence of sectional talks when what we need is a unified national dispute. Assuming that this hurdle is overcome and we proceed to a national ballot in the new year, then what? Despite the portrayal of PCS in the right-wing media and by sections of the left as a "militant, fighting union," it doesn't live up to this image in practice. I've already discussed its shortcomings nationally in the pensions dispute, and elsewhere I've written about similar problems at group level too. Though on the surface more democratic and nominally "left" than many other unions, it ultimately suffers the same structural problems of all reformist trade unions. In terms of industrial action, this means that the usual formula is protest strikes interspersed with periods of inactivity. It means talks going on behind closed doors and too little information going to members. It means accepting "assurances" and "guarantees" that fall far short of concrete gains as a victory even when they clearly don't line up with the demands made. The line from officials on this is usually that they have to balance what's effective against what members will go for. But the answer to this is that if you continually demobilise members and sell managed defeat as victory, then they will of course not be up for sustained action. The union movement has been more than happy to tread this path for the past three decades under cover of Thatcher's anti-strike laws, and PCS to do so during the pension dispute even as all momentum drained and a sense of defeat and despair prevailed. To have a hope of genuine victory in the renewed dispute, a definite break from this pattern is needed. There must be complete transparency. Any and all proposals put forward by the government and by individual departments must be known to members as soon as they are known to the PCS leadership. The union must never keep the bosses' confidence, nor make any moves on members' behalf that those "represented" are unaware of. Ultimately, no agreement whatsoever should be reached without the democratic assent of the membership. Action that results from the ballot in the new year must not be sporadic and interspersed with silent inertia, but sustained. If serious organisation and agitation is needed to build the will for such a fight, then that is what must be done. From all out strikes to sectional, departmental and regional action, from single day strikes through prolonged, rolling and selective strikes to lightning walkouts, and all forms of on-the-job action that can conceivably be organised, the aim should be to maintain genuine momentum whilst causing as much disruption as possible to the job. But, of course, this is not something that the leadership will do of its own accord. Nor is it something we can petition them to do if only we ask nicely enough. Rather, serious rank-and-file organisation is needed to light a fire under their arse. The leadership's only choice must be to move towards the kind of action needed, or be outflanked from below. If that seems like a tall order for a movement that has emerged only in the past three months, that is because it is. The CSRF is still very much a minority tendency within PCS, and though it has been able to achieve far more than expected since its inception, it needs to continue to organise and grow if it is to be able to galvanise workers and put pressure on the NEC. To that end, there is much ground to cover. 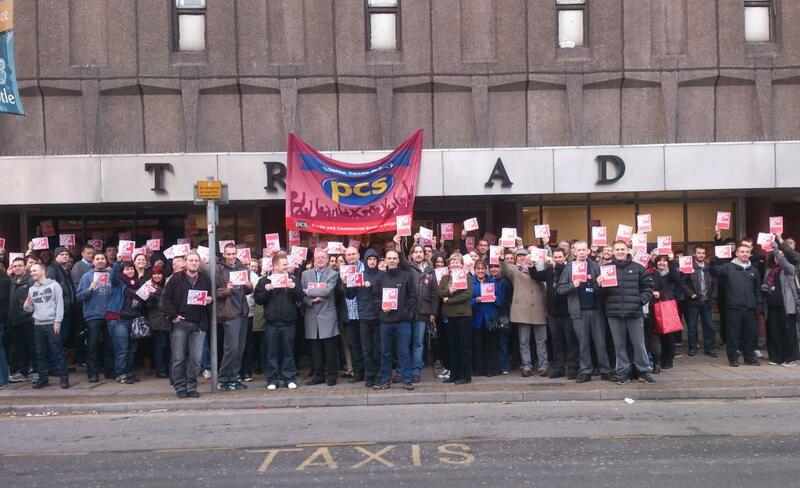 There are offices which are clearly more advanced than others when it comes to the confidence to act, such as HMRC in Coventry where staff not only gave rise to the CSRF with their 18 October walkout but has also held actions on six days thus far, including the in-work stoppage mentioned earlier. But there are also others where it has not been so easy to counter years of demobilisation and demoralisation in order to build any kind of action. Then there are those in between3. Building functioning rank-and-file workplace committees - though the CSRF advocates such committees as a platform for independent direct action, in practice the network is mostly militant reps who support its aims pushing action through traditional branch structures. To grow effectively, it needs to look at changing this dynamic. Organise the unorganised - many civil servants work in offices with other workers, including those who have been outsourced. In some places they are union members, in others they have not. In both cases, the CSRF needs to engage with them and argue for all workers respecting all picket lines as a way to generalise the struggle and advance the interests of the worst off workers. Spreading the reach of propaganda - the arguments for acting "with the union where it will, without it where it won't" need to go much further than they currently do. The CSRF's handicap is that it doesn't have the reach and resources of the NEC, and serious efforts need to be made to overcome this. Mobilise for a high ballot turnout - typically, turnouts for strike ballots in PCS hover around 35%. This needs to improve greatly, not only to counter the government's inevitable challenges to the legitimacy of the strike, but as a way to further engage workers. Mass meetings where people deliver their ballots collectively is a far better way to galvanise the workforce than having them put an "x" on a piece of paper at home. Taking action independently - the reason that the network was able to make the impact it did so fast was because of the potential for action on the ground independent of the leadership. In whatever form possible, action needs to continue wherever the CSRF has support both in the run up to the ballot and through it. None of the above is easy. Nor is it the entirety of what needs doing, as the detail must be worked out by those putting it into practice. But it points to where we must go if we are to see a viable rank-and-file movement that continues to grow and, more importantly, the prospect of a struggle which can actually force concessions from the government. The alternative is to be led, trudging wearily, from one 24 hour strike to the next and defeat sold as victory. 1. There was something of a row over a bulletin that falsely claimed "at the time of writing no formal proposals have been received." The row led to a clarification that "HMRC made an informal approach" which was "subsequently withdrawn." Their excuse being that as they tenuously considered the first letter "informal" they weren't technically lying. 2. There is also the worrying prospect of agreement-by-proxy, as PCS members in DEFRA are currently balloting over whether to accept a "Memorandum of Understanding" that includes some level of agreement over terms and conditions. 3. Where I work, what problems there are lie with the wretched internal politics of the branch. I intend to write more on this at some point, since some of what has taken place has directly (and in my opinion deliberately) hampered our organising capacity.